This ultra-sleek, aluminum body casing hybrid is the future of connectivity. IOGEAR's Thunderbolt 2 KVM Docking Station brings the best of both worlds: it allows you to seamlessly transition from your life on-the-go to your home office and back in the most stylish and intuitive way. Redefining the standards in connectivity, IOGEAR's Thunderbolt 2 KVM Docking Station is designed to elevate your Thunderbolt 2 setup by connecting up to two Thunderbolt 2 enabled laptops / computers and switching between them with the push of a button. Mobile computing no longer means sacrificing performance and flexibility for convenience. 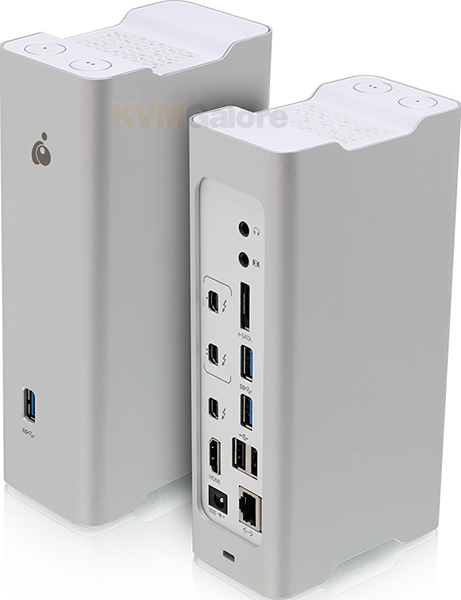 IOGEAR's award-winning Thunderbolt 2 KVM Docking Station transforms computers into complete, high-performance workstations using a single Thunderbolt 2 port. 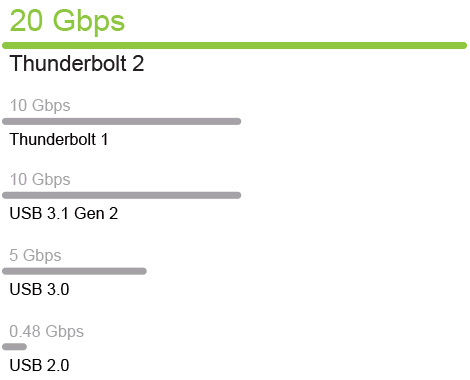 The industry's first Thunderbolt KVM solution takes flexibility to the next level by enabling users to connect a second Thunderbolt 2-enabled computer and allowing both computers to share connected resources. Designed for your Mac setup, this incredibly versatile unit allows you to connect up to 4 additional Thunderbolt 2 devices plus 1 Thunderbolt Monitor (daisy-chained via the Thunderbolt 2 port). Moreover, it allows you to connect up to two additional monitors at HD and 4K (Ultra-HD) resolution, via the HDMI and Thunderbolt 2 ports. Additional 5 USB ports are available for your peripheral devices such as keyboard, mouse, printer, USB drive, camera, etc. Gigabit Ethernet LAN port, as well as digital audio input/out are also provided for a full-featured workstation functionality. 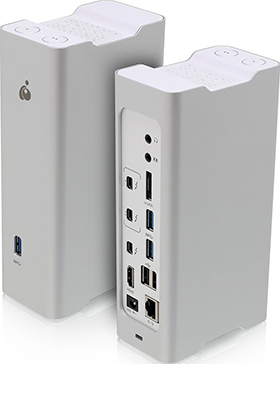 In addition to the functionality of a full-featured Thunderbolt 2 enabled docking station, you can connect up to two independent Thunderbolt 2 enabled computers and switch between them with the push of a button. Build the minimalistic-chic setup of your dreams by connecting multiple computers to this KVM, and use only 1 keyboard, 1 mouse and up to 2 additional monitors. You can also connect your favorite peripherals like your printer, webcam, external hard drive and any other USB enabled accessory. Connect all your devices and share them between your computers with ease. The KVM Docking Station knocks down any connectivity obstacle in your way so you can build the ultimate workstation setup. Utilizing just one Thunderbolt 2 port on the docking station, you can connect up to a total of 4 additional Thunderbolt 1 or Thunderbolt 2 enabled devices such as external disk array, video capture appliance, etc., plus a Thunderbolt monitor from the Thunderbolt 2 port on the docking station. Unravel the remarkable visual experience of 4K Ultra-HD (UHD), at 4 times the resolution of standard HD. The dual video monitor functionality provides astonishing video quality that will please your eyes and provide a higher level of enjoyment from watching videos, playing games, working and creating from your home office. You will be amazed at how the IOGEAR's KVM Docking Station flawlessly supports 4K (Ultra-HD) video output and high-speed file transfer simultaneously. The IOGEAR KVM Docking Station is a connectivity powerhouse. With ultra-high speed bandwidth expansion and a data transfer rate of up to 20Gbps, the KVM Docking Station will allow you to transfer data 4 times faster than USB 3.0, 40 times faster than USB 2.0 and 25 times faster than Firewire 800! With that kind of speed, you can transfer a full-length HD video in a matter of minutes. Utilizing the advantage of the ultra-high speed bandwidth on the Thunderbolt 2 technology, the KVM Docking Station provides peripheral connections as well as data transfer in a breeze. When the host computer goes into sleep or suspend mode, the KVM Docking Station will also go into sleep or suspend state to help reduce power consumption. Because the future belongs to all of us, the KVM Docking Station is the most earth-friendly and stylish option to elevate your Mac setup.